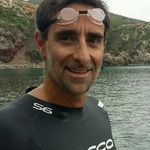 Swim history before SwimTrek Born in Rome, I started swimming since my early years at Circolo Canottieri Aniene (most awarded swimming team in Italy with many Olympians) where I was a swimming instructor during my university studies. I’ve been swimming competitively as breaststroker for a long time both as teen and master. I did my first Open Water competition about ten years ago and I loved it! I moved to Australia where I swam in Port Phillip Bay with lots of animals but thankfully I’ve never met a Great White! Currently living in Ibiza which is a dream location for the open water swimmers. Locations guided on I took part of a memorable Swimtrek in the Greek Cyclades few years ago and since then I’ve been dreaming to be a Swimtrek guide. Since I moved to Ibiza, I’ve been guiding groups around the amazing coastline of the white island. Most memorable swim moment During the summer 2008 I swam the Sicily Strait, pretty much a MUST for an Italian swimmer, and I will never forget the incredible color of the deep blue water. And the old ladies clapping their hands from the balcony of the houses built right on the beach where we arrived. Top swimming tip Swimming for me is all about relaxation and gliding. Enjoy every single stroke, get lost in the blue. If your muscles are relaxed and your consciousness gets into a meditative state, your swim will be incredibly enjoyable and efficient. Interesting fact I’ve been working for major sport events for almost 20 years. In Rio 2016, I was the Mixed zone Manager at the Olympic Aquatic Center for Swimming and Waterpolo competitions. I was lucky enough to witness live the last sensational strokes of Michael Phelps.